Is it too early to be feeling festive? Because of complications with our little loaf-to-be (see this post) we’ve decided to stay close to our specialist hospital in London this Christmas, and will be celebrating in double family style (my husband’s and mine) for the second year running. Mentioning that we’ve voluntarily spent Christmas with both parents and in-laws together gets the odd raised eyebrow, but if it’s anything like last year, we’re going to have a ball. The three bird roast has been ordered, bedrooms allocated and my phone is full of tentative present ideas. This is a time of year to embrace family, and we’re so fortunate for what we have. Marshmallows always make me think of Christmas. It’s the time of year to dunk them in mugs of hot chocolate, toast them over an open fire and stick them into s’mores. 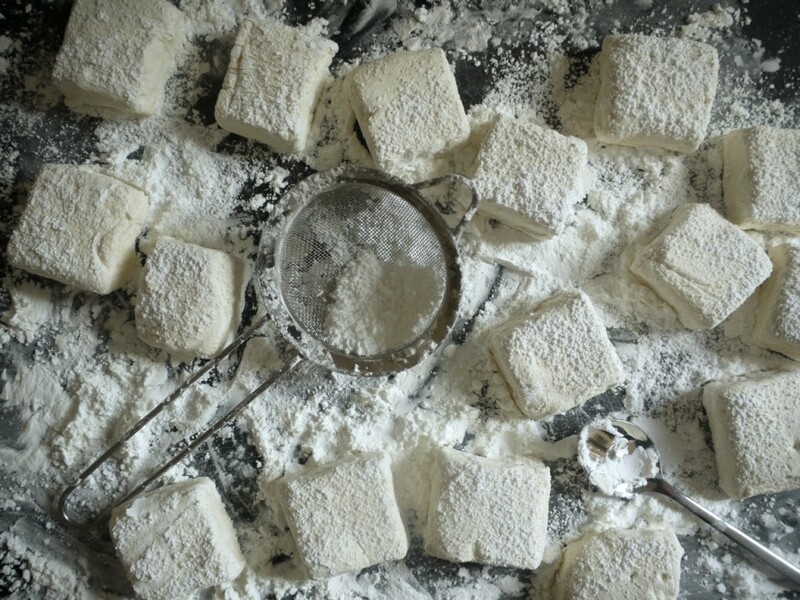 There’s also something so snowlike about that shower of sugar and cornflour coating – in fact I’ve just printed a bunch of Christmas cards with the marshmallow photo from my book on the front. It’s the sweetest snowstorm you’ll ever see. Last week I needed to retest a recipe from my book for Sous Chef, a glorious treasure trove of cooking delights and the perfect place to head if you’re looking for a present for the food lover in your life. 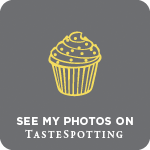 They wanted to feature my marshmallow recipe on their website, but sell a different type of gelatine to the one I use as standard. After a couple of rounds of testing (the first batch ended up as goo which I’m planning to swirl into homemade Phish Food ice cream) I was happy with the results. I also had two enormous tins full to the brim with homemade marshmallows just begging to be eaten. S’mores are an American treat I’ve rather adopted into my heart: I love the combination of crumbly biscuit, gooey marshmallow (with just the right amount of char) and melting chocolate. With the weather cold enough to crank up the heating this weekend, I obtusely decided to convert that warming winter treat into something I could drink, and this is the result. 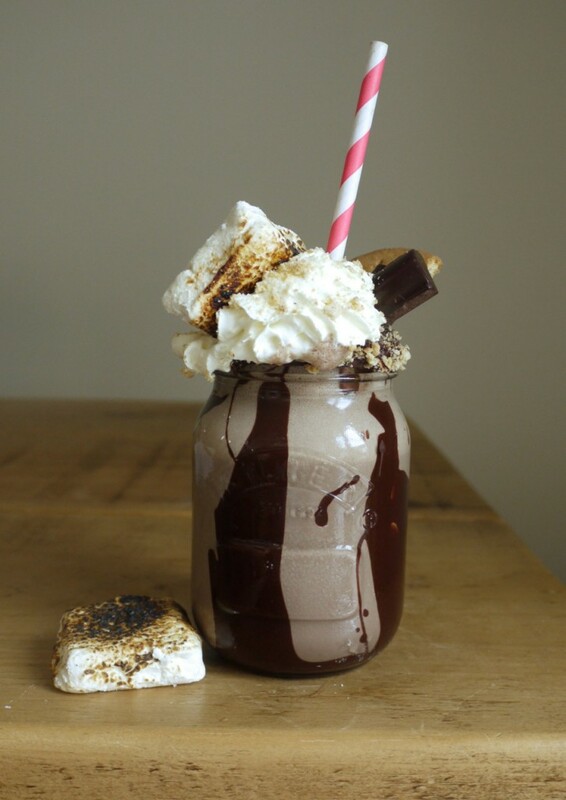 The toasted marshmallows add flavour plus a velvet smoothness to a classic ice cream shake while the extravagant toppings are enough to put a smile on anyone’s face. 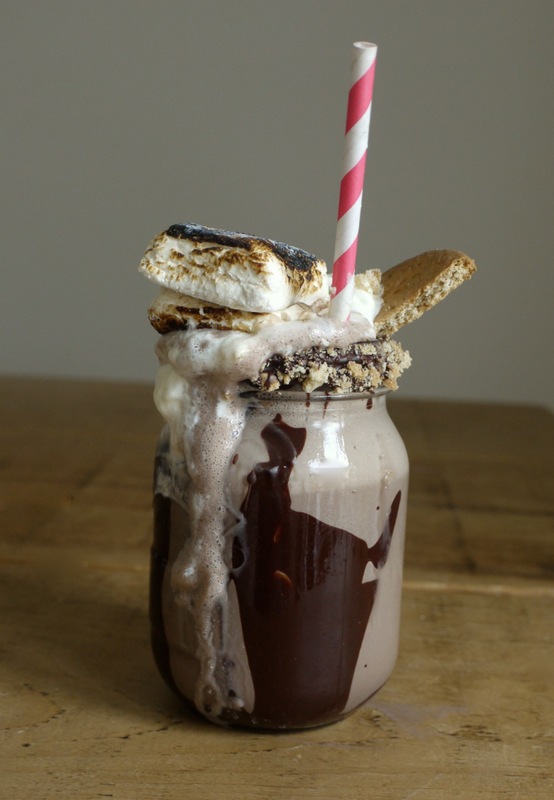 If you use homemade marshmallows, digestive biscuits and chocolate ice cream (recipes for all three in my book), it takes these shakes to another level. 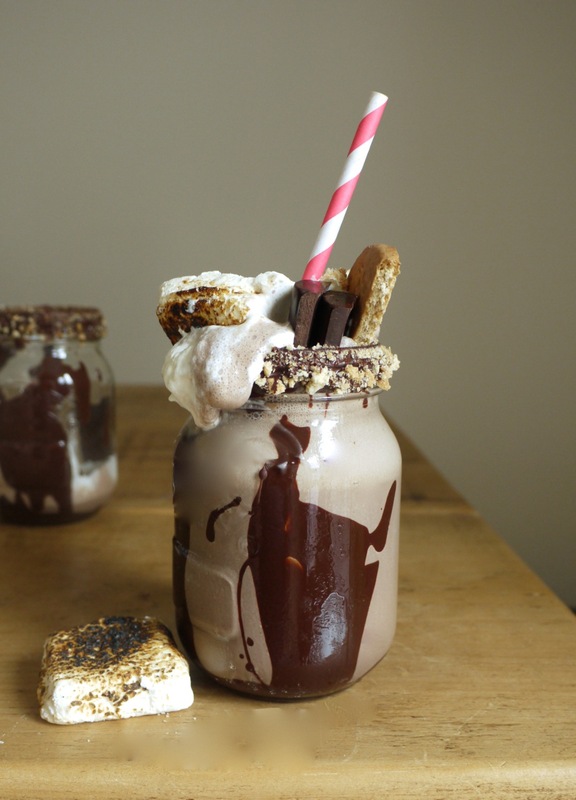 Toasted marshmallows add a sweet creaminess to these thick chocolate milkshakes. 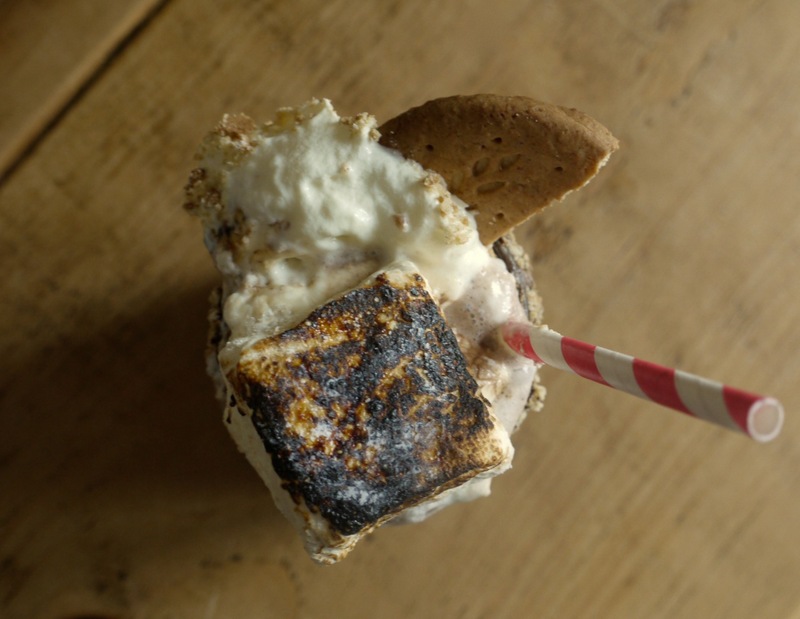 Topped with clouds of whipped cream, crumbled digestive biscuits, melted chocolate and more toasted marshmallows, they're a British take on a s'more in drinkable form. Start by toasting your marshmallows. I do this using a blowtorch but you can caramelize them under a hot grill or over an open flame on the hob, watching like a hawk to ensure they char but don't completely blacken. Set aside to cool slightly. Break off a couple of squares of chocolate for garnish, then melt the rest in a small bowl in the microwave or over a bain marie. Crumble two of the digestive biscuits into a separate bowl. Dip the rims of two serving glasses into the melted chocolate then into the biscuit crumbs to coat. Drizzle the remaining melted chocolate down the sides of each glass. In a blender, combine four of the toasted marshmallows, the ice cream, milk and salt, blitzing until smooth. I like my shakes thick, so you may want to add a little more milk to suit your taste. Divide the shake between your two glasses. Top with whipped cream, two toasted marshmallows, half a digestive biscuit and a square or two of dark chocolate. Add straws (and possibly spoons) and serve immediately. You can find recipes for homemade marshmallows, digestive biscuits and chocolate ice cream in my cookbook, Homemade Memories. This milkshake looks insanely good. I am impressed you could still stomach this after several rounds of testing a marshmallow recipe! 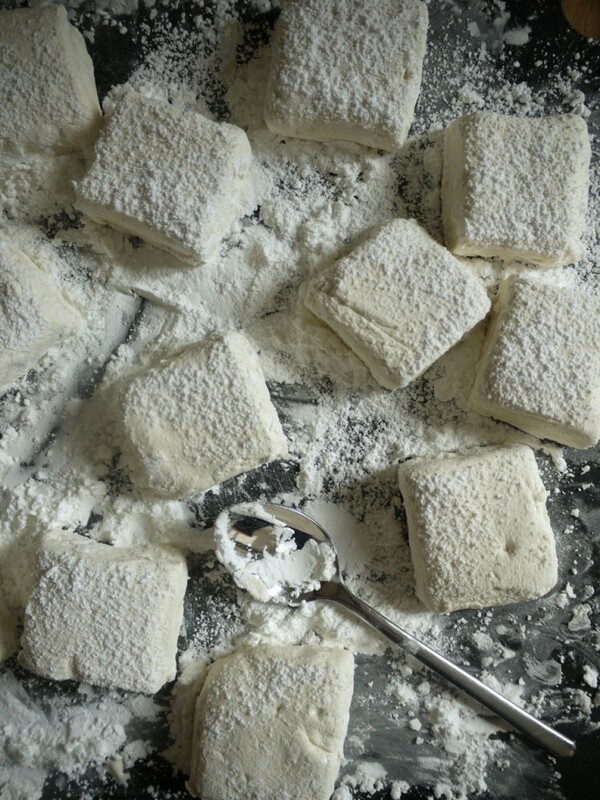 I remember working on a vegan version for a magazine a couple of years ago and once I was into double digits of test batches I completely went off marshmallows for about a year! I quite like the sound of your Christmas celebrations – it sounds like you are fortunate to have lovely families on both your side and your husband’s. I never understood how people dreaded the holiday season – I love spending time at home with my parents, siblings, nephews and my niece! Rather jealous of all those who receive Christmas cards from you now Kate -I shall have to stare fixedly at my copy of HM instead. You know, on the topic of marshmallows and tweaking for different gelatine brands: I can’t eat any as I’m a vegetarian. It would be truly wonderful if you came up with an animal-free version -there are a fair few of us out there who have to miss out. I am dying right now – this looks SO GOOD! 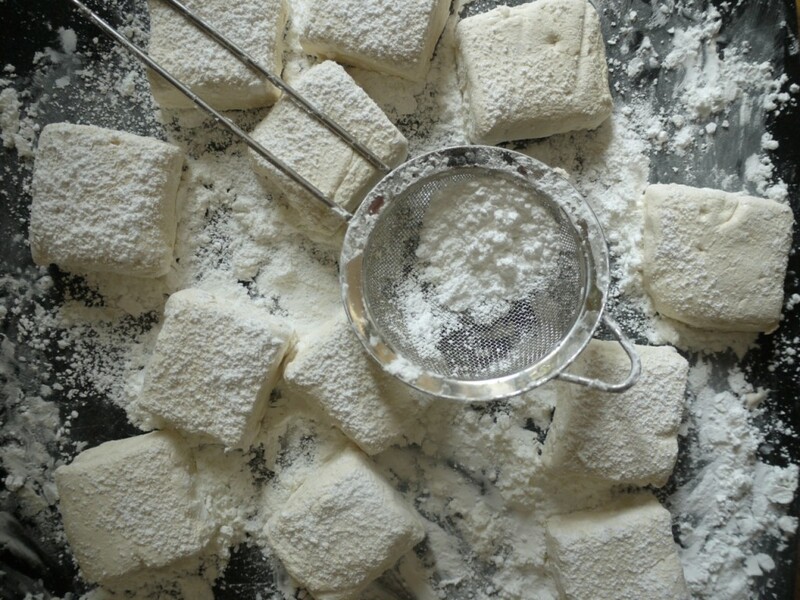 I love the homemade marshmallows in this recipe! Well this looks spectacular! I am a sucker for anything s’more related and this is surely going to be made at our place over the holidays. I think your Christmas plans sound so fun – how great to have everybody in one place! xo. ITS NEVER TOO EARLY TO CELEBRATE CHRISTMAS (Sorry, but it is the very best time of year!). Perfect recipe for a soggy Sunday afternoon on the sofa!